We can see that DASH was bullish against bitcoin in the first 3 months of the year. Then it basically traded sideways in a choppy manner. It has been essentially in a neutral-bullish mode. 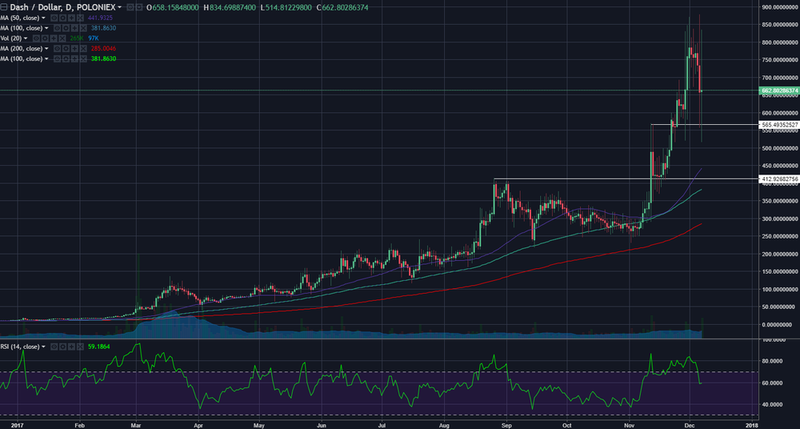 This week's price action is bringing DASH towards the support of the consolidation since April. If the market is still neutral-bullish, we should find a lot of buyers around 0.035-0.37. If the current bitcoin momentum gets extended, we can see DASH/BTC closer to 0.030. If bitcoin slows down, and DASH is in this 0.030-0.035 area, I think the market will buy it back up. When it does, there is upside to 0.060. As we can see below, DASH has been bullish against the USD, until it found resistance around $850. This week, DASH not only dipped against bitcoin, it also retreated against the USD. In this retreat, we can see that there is support around the $550 area. I think we will get a few more shakes (up and down movements), but if DASH finds support around 550 USD and above 0.030 BTC, I think it will be bullish in 2018.